The MH-60 Blackhawk is the US Military troop insertion Vehicle of choice. Used in the Special Operations role mainly for inserting small squads of men behind enemy lines. The Blackhawk is a very versatile aircraft and is not only available in the troop transport mod but also in transport of supplies and as an attack aircraft. The 160th SOAR operate 3versions of the Blackhawk, the MH-60K, MH-60L and MH-60L DAP. (Direct Action Penetrator) Secondary missions of the MH-60 include external load, CSAR and MEDEVAC operations. The MH-60 is capable of operating from fixed base facilities, remote sites, or ocean going vessels. The MH-60 Special operations version has been upgraded with advanced integrated cockpit, upgraded engines and transmissions, forward looking infrared (FLIR), terrain following/terrain avoidance (TF/TA) radar, additional internal fuel tanks, ATAS, external tank system (ETS), upgraded door guns, upgraded navigation and communication systems, integrated aviation support equipment (ASE), external rescue hoist, and a folding stabilizer. It has an air-refueling capability which allows it to drop troops far into enemy territory in bad weather conditions. The MH-60 is ran by a crew of 4, 2 Pilots, 1 Flight engineer and 1 Gunner. The MH-60 is one part of the US Special Operations Command (SOCOM) target of creating an integrated fighting force that can fight a combined war between land, air and sea. The MH-60 allows crack troops like Green Berets to move drop into one place then be extracted again before the enemy knows there. The ability for troops to be able to call in close air support to extract them is a vital asset of current US Special Operations groups. A good example of this capability is shown in the Blackhawk down situation in Somalia, Blackhawks provided close air support and the ability to drop Delta Sniper teams into the crash sites, a capability only dreamed of by commanders in past wars. The downside to the Blackhawk is its ease to shoot down with a MANPAD missile system. A Mach 3 Missile is very hard for a chopper pilot to avoid and the Blackhawk makes its self a big target when its having to come low to pick up or deploy troops. This is why Special Operation Teams are often inserted at night in the Blackhawk because it is hard to see and its non-directional rotor blade makes it hard for a un aided person to tell which direction the aircraft is coming from. Of course the Blackhawk is not undefended, an attack would have to be brave indeed to show himself to either of the flanks of the helicopter which are protected by 7.62 Miniguns firing either 2000 or 4000 rnds per minute. The Blackhawk also has Kevlar armour to protect vital areas such as the electronics, engines and the cockpit which has bullet proof glass capable of stopping 7.62 ammunition. Its armour can stop high explosive rounds and 23mm rounds as well. The flight controls are armoured and the electric and hydraulic systems can be lost with out major consequence to the aircraft. The fuel system is crash resistant and self sealing, the body can absorb high impacts from a crash and the seats are designed to absorb energy. 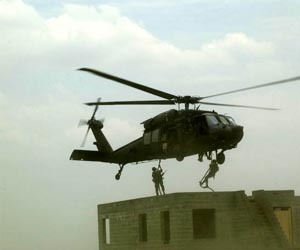 To comply with the integrated battle field target of a combined system the Blackhawk has a voice and data communications suite including VHF, UHF communications, an identification friend or foe (IFF) transponder, secure voice communications, satellite communications and an intercom system. The Blackhawk is a work horse of the modern US Army and is a very adaptable and upgradeable aircraft as the MH-60K has shown. Its life in the US Military's service does not look set to be concluded any time in the near future, specially seen as its part of the integrated battlefield technologies.